So now we are really excited! Today was spent on packing, but really that is just the tip of the iceberg of what we have been doing for the last several months. Sherie and I prepared our bodies, our bank accounts, our work schedules, our bicycles, our wardrobes, our toys and tools to get here. As I write, the countdown on my desktop shows 3 days, 5 hours, and 28 minutes to go! Yesterday Sherie’s knee ached a bit, much like it had all week. So she made the wise decision to skip that last ride on the “big bikes” and do errands. Ben rode the GPC time trial loop, just to measure his fitness. After six months of hill training, he was a whole one minute faster (1hr:04m:04s) than his previous best, but no where near close to his hoped for one hour or better. Oh well, lets hope the training does what it was designed to do: let Ben climb all day. We rented “bike boxes” from the club. We got two different models of “hard cases.” In packing, we couldn’t keep either under fifty pounds with the minimal installed. So we packed some extras in each box and have about 58 lbs in each box. We will just have to pay the airline the outrageous $200 fee to transport these, as they are now considered oversize anyway, even if they are less than 50 lbs. Ben’s bike packed pretty well in the big box. 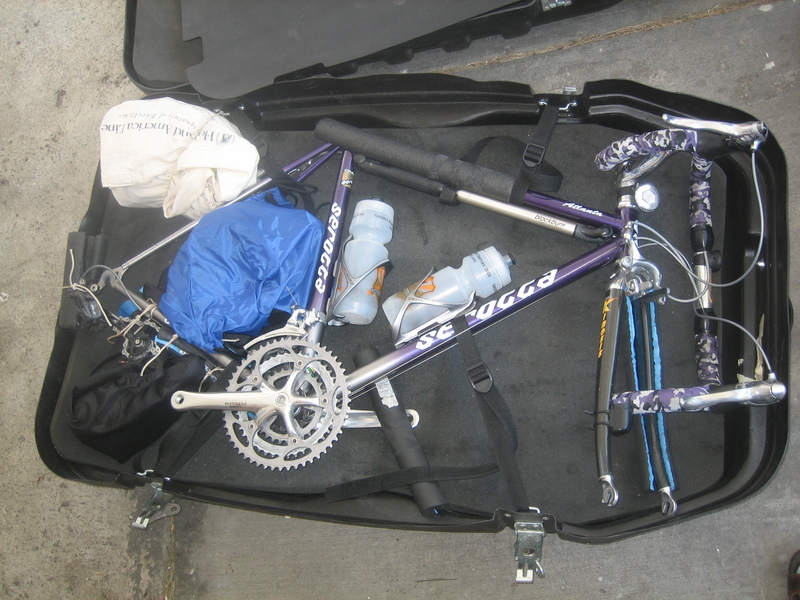 The saddle, helmet, and some tools and clothes went in as well, with more foam to pad between the frame and the wheels. Lets hope the one missing wheel makes it not too hard to drag. Sherie’s bike too with all accessories out of the box was over 50 lbs, so her bike box too had extras inside. Instead of a hinge on one side, the top comes completely off. Because it does not have a stiff frame like the other box, it seems to be more flexible. If that makes it more or less durable is something we will find out. We packed a small roller bag each as well. Sherie seems only to have forgotten to pack cosmetics for now. Ben had to add his Gore-tex rain jacket just in case a monsoon hits. We will also carry our backpacks onto the plane with our cycle shoes and pedals, one kit of riding wear, camera, laptop etc. If our bags arrive late, we could then rent bikes so we could ride on our first day there. Meanwhile, over the last few months, we have arranged four hotels for our stays. Sherie has been the chief correspondent, using her German language skills at times. Shuttles to/from airports on both ends have been arranged. I can’t wait to get off the plan and see the man with the “Reineman” sign to take our bags and drive us to the hotel. We will arrange train/bus transport to get into the Dolomites from the Veneto when we hit the ground in Italy. House sitters and cat caregivers have been arranged. Thanks all for the encouragement. It would make me glad if you took a moment to comment within this site. Please click “Leave a comment” under any post if you have some insight or reactions to share. 7 Responses to Ready to Go! No kidding! It does seem like we spent way too much time getting ready to go with all the details. Thanks Sherie for the efforts in getting this organized, and the motivation to get me going in the morning to whip our butts into shape. Looking forward to your posts and photos. Just the discussion about the bike boxes has been very educational. More more…. and good luck! Looking good guys, sounds like you’re nearly ready to go! Best wishes for the trip of your dreams to go off as planned! Can’t wait to hear your stories and see your pictures! We just got back from Italy… what a wonderful country! Great riding, food and people! WOW !!! Looks like you two are ready. Have a safe trip ans ENJOY !!! Ben, in our opinion you’re superb in just about everything you do; add to this your ability as a writer, because you completely fascinate with these entries about preparations and we can feel your excitement. 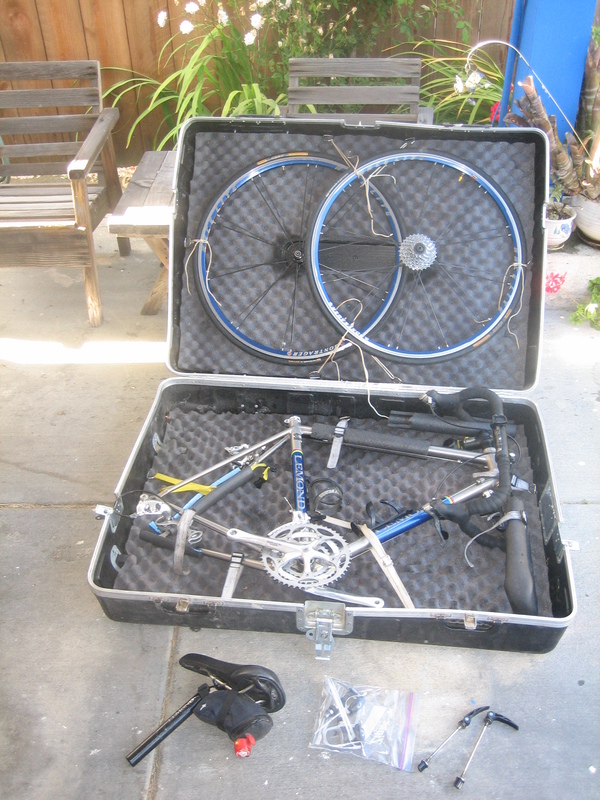 Great snaps of your rides and pre-departure bike-packing, too. Waiting breathlessly for the next entry, hoping Sherie’s knee holds up, that the rain jacket won’t be needed, and that good times will have been had by all.